TEHRAN -- The white-coated scientists at Tehran's Royan Institute labor beneath a framed portrait of the turbaned, bearded supreme leader of the Islamic Republic of Iran, the head of a state that enforces strict religious rules governing everything from how women dress to what kinds of parties people throw. But in the cutting-edge field of human embryonic stem-cell research, the scientists work with a freedom that US researchers can only dream of: broad government approval, including government funding, to work on the potent cells from early-stage embryos that researchers believe hold the promise to cure many diseases. In 2002, Iran's supreme leader, Ayatollah Ali Khamenei, gave his blessing to research on surplus embryos created for fertility treatments -- work sharply restricted in the United States under pressure from religious conservatives -- calling it a ``lofty" effort that fit his goal of making Iran the scientific leader of the Muslim world. The scientific ambitions that led Iran to embrace one of the world's most open policies on stem-cell research also help to explain why many Iranians support the nuclear research program that has thrust their country into a dangerous international confrontation. Iran's leaders have declared that the nuclear program will restore Iran's scientific glory, tapping into a deep-seated national pride in science and education that dates to the Persian Empire, a center of world learning in the Middle Ages. Tehran insists the program aims to produce nuclear energy for peaceful purposes, while the United States, Europe, and the United Nations say it aims to build a nuclear arsenal that it might use to threaten Israel and the West. Iranians' dedication to science presents both a challenge and an opportunity for the international community: Many Iranians believe the government's argument that nuclear research is central to technological development. But educated Iranians also yearn to be part of the broader academic and technological world and fear the government's confrontational approach could increase isolation. Caught in the middle are Iranian scientists. With government backing, they have been able to launch health initiatives -- from family planning and drug-addiction therapy to prevention of heart disease -- that have won admiration from leading US researchers. But they also face restrictions -- from the West and from their own government -- that make it hard for them to take part in international scientific exchange. 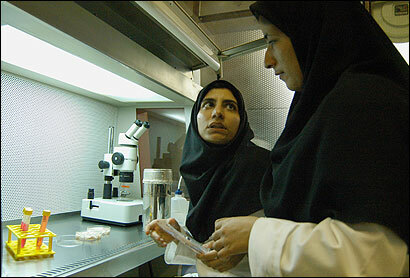 Iranian scientists who travel abroad can face accusations of having too much contact with foreigners. And they are often denied visas to Western and Arab countries that mistrust Iran. Science is at the center of Iranian nuclear rhetoric. In a speech on Jan. 3, days before Iran resumed uranium enrichment -- a key step in developing both nuclear energy and nuclear bombs -- Khamenei exhorted Iranian students to work hard to restore Iran's historical status as the ``mother of science." And when the international community objected to the renewed enrichment program, setting in motion the current crisis, President Mahmoud Ahmadinejad accused the West of trying to impose ``scientific apartheid," denying to a Muslim state the right to nuclear energy that other countries enjoy. Yesterday , Khamenei said Iran would continue ``with patience and power" to pursue ``the sweet fruits" of nuclear research, signaling that the government would reject an international deal to suspend the program in return for economic incentives and technical aid for peaceful nuclear energy. The UN Security Council has given Iran until Aug. 31 to stop the program or face possible sanctions. When asked recently about the controversy, Iranians -- from day laborers painting a fence to young women at Friday prayers -- recited, ``Nuclear power is our indisputable right," often with a giggle because the government's mantra has become a cliché. Still, many Iranians say nuclear power resonates as a symbol of prestige and development. But it's not clear how much of that support extends to developing nuclear weapons. A poll conducted in January by the Iranian Students Polling Agency showed that 85 percent of Iranians support nuclear research. But that number dropped to 64 percent when respondents were told the program would lead to international economic sanctions, and 56 percent if it were to spark a military attack -- high numbers, but perhaps not as high as might be expected after months of exhortation from a government that brooks little dissent. At the Royan Institute, affiliated with Tehran University, researchers spoke guardedly about the nuclear dispute. Dr. Reza Samani, the institute's spokesman, said that in the spirit of scientific openness, the government should allow inspection of its nuclear facilities -- and that the West should not apply harsher standards to Iran than to other countries. ``Science and politics should be separate," he said. ``We need to purify science." Domestic and foreign constraints on Iranian scientists have helped fuel one of the world's highest rates of ``brain drain." In 1990, according to an International Monetary Fund study, 15 percent of Iranians with college or graduate education had emigrated to the United States. In some areas, scientists have complained of official pressure to insert religious perspectives in their work, but in others, the Islamic Republic is remarkably pragmatic. With condoms and birth control information widely available, Iran's fertility rate dropped from 5.2 children per woman in 1986 to 1.9 in 2002. Researchers at the Harvard School of Public Health, who hosted Iranian scientists at a weeklong exchange program in 2003, were impressed that in the previous 16 years, Iran had cut its infant mortality rate in half and raised life expectancy to 70 years from 60. Iran cites the Royan Institute as the jewel in its scientific crown. Its fertility clinic, packed with couples one recent morning, claims a 40-percent success rate, with 20,000 patients a year. In a hallway, politics intrudes: A sign echoes Iranian officials' call to ``wipe Israel off the map." But in the more private lab area, the only slogans are quotations from Khamenei exhorting researchers to scientific excellence. Crammed in tiny laboratories, Royan's scientists earn salaries of about $500 a month. Yet they are motivated by their country's science push, particularly on embryonic stem cells, whose ability to develop into any kind of adult cell has raised hopes they can be used to repair organs. Samani, 38, the spokesman, proudly pulled from his files a letter from Khamenei, in which the supreme leader praised the researchers' ``lofty objectives" and predicted they would bring Iran ``huge humanitarian wealth." ``But," Khamenei admonished, ``be careful that producing identical parts of human beings does not lead to producing a human being" -- echoing a widespread scientific consensus against human cloning. The green light for embryonic stem cells was possible because Shi'ite Muslim scholars have long ruled that a developing fetus is infused with a soul only at the age of 120 days. That allows stem-cell research in Iran to steer clear of the abortion debate that has made it controversial in the United States. Six months before Khamenei approved the research, President Bush sharply restricted US government funding for such work because it requires destroying human embryos, a move spurred by religious conservatives who equate the research with murder. Bush's decision means vital government funding is available only for work on embryonic stem-cell lines established before August 2001, a rule that scientists say sharply constricts research. But Royan's scientists have developed several new lines. They reported on the protein structure of one line in the respected journal Proteomics in June, and posted the data on their website. In one project with less-controversial adult stem cells, cells from a patient's bone marrow are developed into cornea cells to repair vision. The institute is also working to clone a sheep. Royan has brought some top doctors to Iran. Dr. Sarah Berga, chair of obstetrics and gynecology at Emory University, spoke at a Royan conference in 2004. She recalled her astonishment when -- wrapped in the unfamiliar headcovering and long jacket that Iranian law requires women to wear -- she heard a video presentation explain that embryonic stem-cell research was halal, permissible under Islam. ``The irony of it was just incredible," she said recently. ``This is what I wish our attitude to stem-cell research would be." More information on Anne Barnard.